Nevertheless, most artists in the early Renaissance were considered craftsmen so any honor conferred on them by a ruler immediately elevated the individual artist to a rarified realm. Vasari reports how in the fifteenth century Gentile Bellini went to Constantinople, was received by the Sultan with “great honor” and was given a gold chain. After Titian painted himself wearing one or more gold chains in several self-portraits, the chain quickly became a symbol of an artist’s stature. 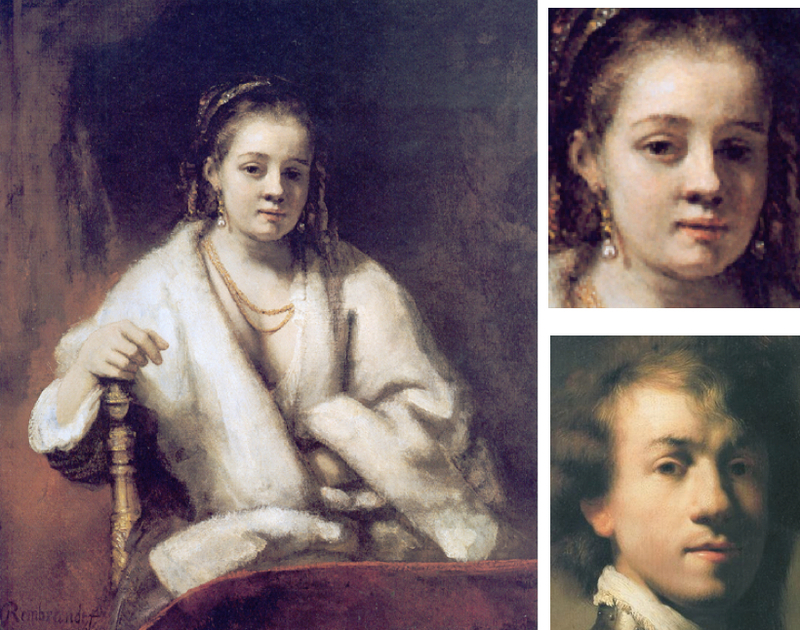 Vasari, Bandinelli, Rubens and Van Dyck all painted their self-portraits wearing a gold chain. 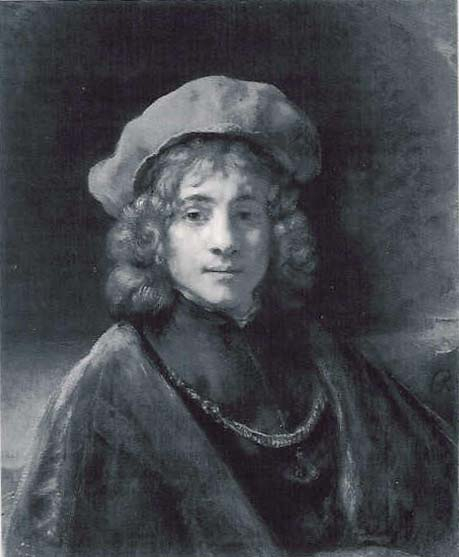 Rembrandt, on the other hand, in the Dutch Republic had no royal patrons and could only depict the honor due to him as a great master fictitiously. His depiction of Lucretia, discussed in a separate entry, is a good example. In stabbing herself, she “paints” herself but, also, as an alter ego of Rembrandt, she wears a gold chain as a mark of his stature. The identity of the figure in a painting known as Aristotle Contemplating the Bust of Homer is in dispute but, whether Aristotle or Apelles, the most famous Greek painter in Antiquity, the underlying meaning is similar. 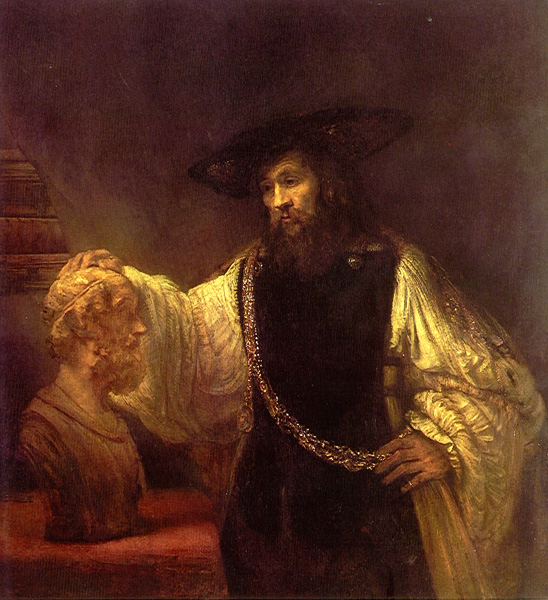 Rembrandt as “Aristotle or Apelles” touches (and thus “paints”) the head of Homer as “a work of art” while wearing the gold chain as a mark of both Rembrandt's and Aristotle's (or Apelles') distinction. The equally fictitious gold chain around his son’s neck in Portrait of Titus indicates again that Titus is a self-representation of his artist-father. 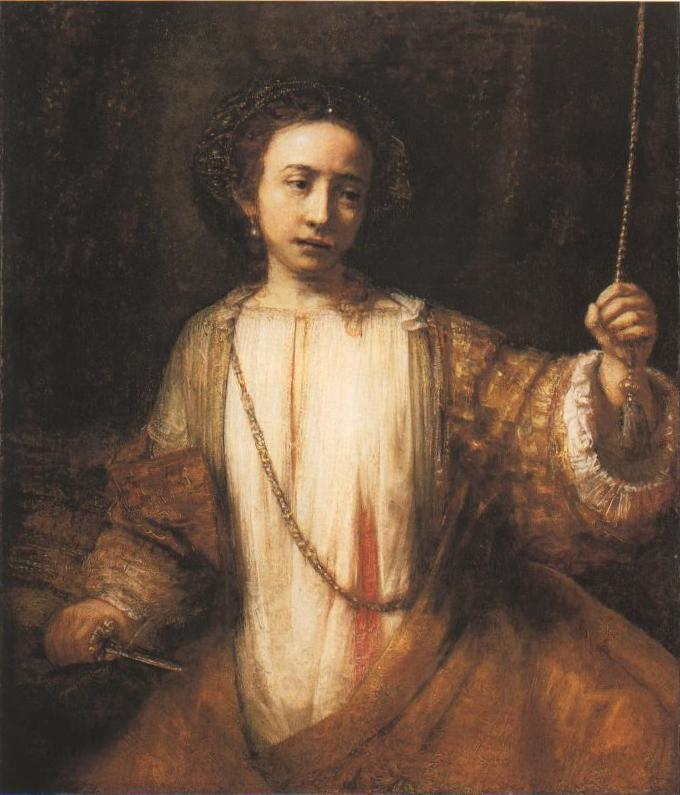 Hendrijke Stoffels was Rembrandt's mistress but he posed her here looking so like his self-portrait from thirty years earlier that she must be a female alter ego of Rembrandt. That then makes sense of the gold necklace which she probably did not own in life but wears here as a mark of Rembrandt's distinction and not her own. Her hand rests on the arm of the chair as though it was a sceptre. 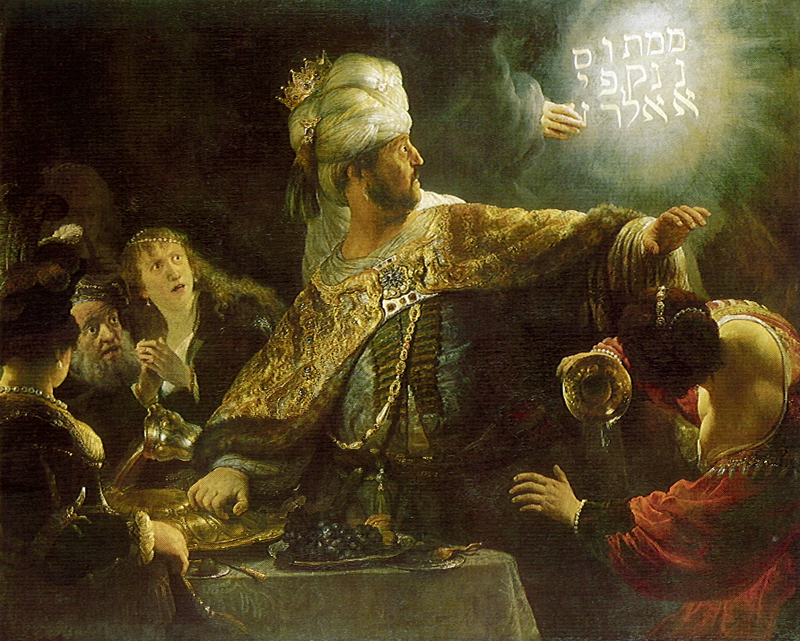 Belshazzar’s Feast is a more complex painting. Nevertheless Belshazzar again wears the gold chain of a great master. Gold chains were, of course, given to people in many fields but when such a chain appears in the work of a great master, it is almost always – on the underlying level – a reference to the artist himself. Rembrandt’s interest in chains and his evident desire for one is somewhat touching considering how honored his contemporary and rival Rubens was in neighboring Flanders. Rubens traveled all over Europe receiving several gold chains and an English knighthood. 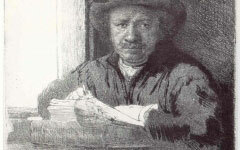 Yet even though Rembrandt hardly ever traveled and never gained a royal commission, the gold chain shone in his mind and in his art as a symbol of the honor due to him as a great master. 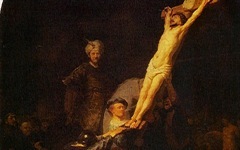 This painting which depicts Rembrandt crucifying Christ is an excellent example of the alternative way to read art, not viewing it as an illustration but as poetry. 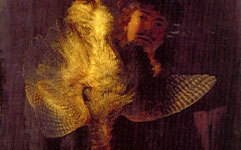 This painting of a young Rembrandt holding up a dead bird as though he were the hunter has troubled art scholars for years. See how one great master resides in another, or sometimes two. Original Publication Date on EPPH: 20 Feb 2011. © Simon Abrahams. Articles on this site are the copyright of Simon Abrahams. To use copyrighted material in print or other media for purposes beyond 'fair use', you must obtain permission from the copyright owner. Websites may link to this page without permission (please do) but may not reproduce the material on their own site without crediting Simon Abrahams and EPPH.